Android is a growing platform on smartphones and archive files are popular for a long time to distribute multiple files at once. So, compatibility between the two is a must. Android does not comes with any built-in archiver software and so you have to rely on third party solutions. 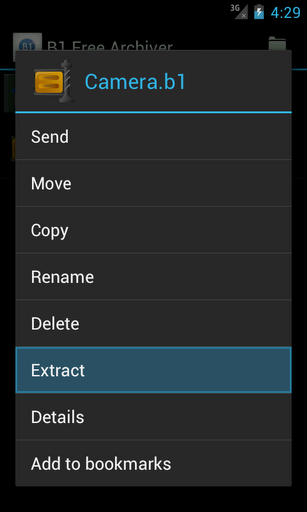 It’s really hard to find nice, powerful, yet free archive manager for Android. B1 Free Archive for Android is a latest entry to the list of free archiver softwares for android and already has gained enough popularity. Currently it supports opening and extraction from .b1, .zip, .rar & .7z archive types. It can create .b1, .zip archives. Can open and extract .b1, .zip, .rar & .7z archive types. Can create .b1, .zip archives. Multilingual: supports 30 languages. You can also translate this app to your language. This entry was posted in Android, Archive Management, Free, Software and tagged Android archiver, Create .b1 archive, Extract .b1 archive, Free Archive manager, Open .b1 archive.